Jennifer Stoner Interiors has been heavily involved in a lot of renovation and construction projects for the past several years, with a big emphasis on luxury bathrooms. This year at the Kitchen and Bath Industry Show (KBIS) in Orlando, Florida, all of the plumbing lines had beautiful showrooms with a lot of energy and new introductions. One standout was the Lixil Corporation's showroom with their luxury brands, DXV and Grohe. Each of these lines had some particularly ingenious and beautiful new introductions! Exhibiting a versatile combination of modern design and functional geometry, the new DXV Modulus collection offers bath fixtures, faucets, furniture and accessories ideal for a luxury bathroom setting in residential and hospitality applications. This assortment expands the DXV Modern Movement, a curated selection of bath collections that celebrate the play of artful lines and flowing forms against contrasting, geometric structures. Showcasing softly angular lines, the elegantly simple form of these DXV Modulus bathroom lavatories incorporates a sink bowl, a “dry” ledge and a semi-wet, transition zone to gather toiletries and personal accessories for convenient access. A coordinating solid surface accessory tray is designed to integrate perfectly onto the adjoining transition zone. This rectangular tray can easily be moved and stored in the matching wall-mounted DXV Modulus vanity or storage cabinet drawers. This is the perfect example of form meeting function! And check out this new DXV tub! The waterfall feature that comes out just below the headrest is inspired by hot springs and is designed to deliver a soft veil of warm water from an elongated spout. I already have one of my clients ready to specify this for the master bathroom in the new home that we're helping to design. I have a feeling that we'll be placing these in a few other client's homes as well. How about yours? Another star in the Lixil Corporation's portfolio is the German plumbing powerhouse, Grohe. Grohe is the world's leading supplier of luxury plumbing fixtures. Over the past ten years alone, the success of GROHE has been confirmed by more than 240 design and innovation awards. 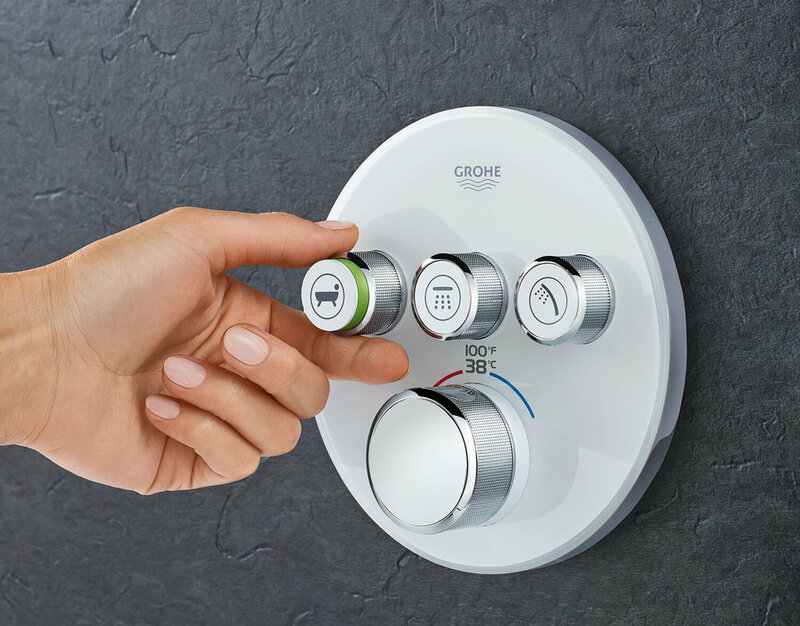 This year at KBIS, Grohe has expanded their Grohe Smart Control shower fixture offerings with their new GrohTherm Smart Control Trim. The “Push, Turn, Shower” experience has become even more multifaceted, thanks to a new model and combination options being added to this popular line of smart shower controls. The expanded range includes a concealed behind-the-wall model that offers an innovative universal rough-in valve for more efficient installation. 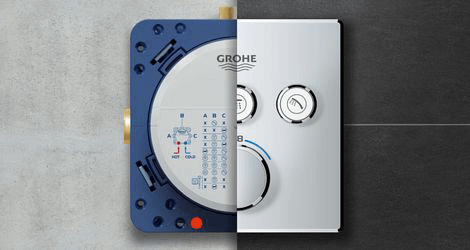 This concealed GrohTherm SmartControl trim offers the option of having up to three shower outlets running through a single wall plate. In a shower with multiple showerheads and body jet sprays, this eliminates the need for multiple valves and diverters or "handles" in the shower. With all of the money we can spend on beautiful tile in our showers, this sleek design allows the tile to become the main focal point! And your plumber will thank you also! Behind the wall powering the GrohTherm SmartControl trim is the new Rapido SmartBox. This innovative valve has some unique features that make installation simple and easy. Water supply inlets are positioned at the bottom of the valve, eliminating the need for additional adaptors and simplifying installation. This pioneering valve also adds no additional depth to the wall trim with its super slim design, maximizing room in the shower for user comfort. This is the kind of nerdy stuff designers who do a lot of bathroom remodels get excited about! Sometimes it's what's going on behind the wall that really makes all the difference to the final look of your shower. If you're considering a bathroom remodel project, give us a call! We can inspire you with all sorts of great product we found at the 2018 KBIS show.